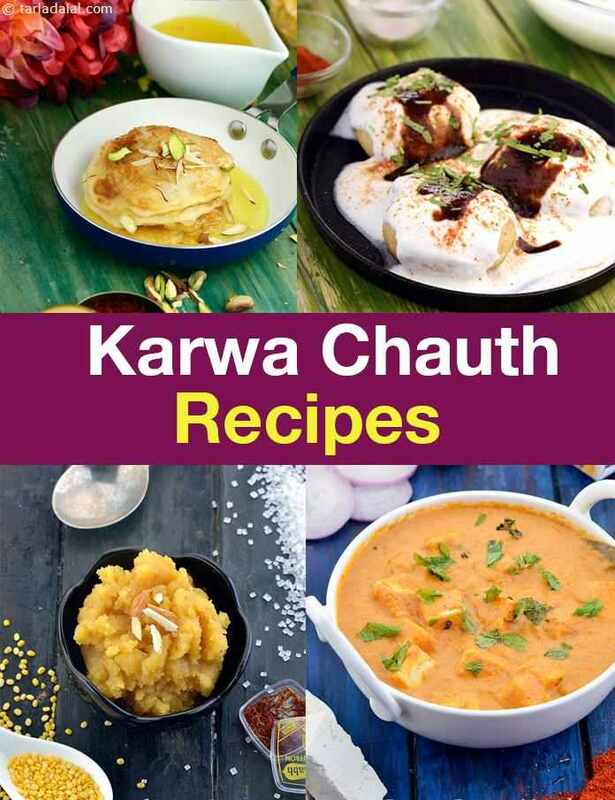 Karwa Chauth (Karva Chauth) is a popular festival from Northern India predominantly celebrated in the states of Rajasthan, Haryana, Uttar Pradesh and Punjab. On this day, married women observe fast for long life of their husbands. The word Karwa Chauth has been derived from Hindi word “Karwa” meaning “a small earthen pot” and “Chauth” means “fourth”, referring to the time in which the festival falls. Before the sunrise, women eat fruits and sweets. The fruits and sweets are sent by their mother-in-law and this ritual is known as 'sargi'. All the women observing fast, come together and sing songs and perform puja. They do not consume anything during the day except for water. The fast is broken only after seeing the moon. Once the moon rises, the women see its reflection in a thali of water through a sieve or dupatta. The husband then offers her wife with a sip of water and thus breaks her fast. They offer water to the moon and seek blessings for prosperity and safety. Just like other Indian festivals were food is a part of the celebration, even on Karwa Chauth food is an important aspect. After the puja, the fast is broken and the feast begins. Varieties of Indian sweets like halwa, malpua, rasgulla, laddoos are made and consumed by one and all. A thali generally consists of a dry subzi, subzi with gravy, flatbreads (puri, paratha, naan, etc), sweets, snack and side-dishes like raita, chutney, pickles and papad. Paneer butter masala with naan, boondi raita, dahi vada and malpua are some of my favorite delicacies. Here we have listed down an assortment of dishes which you can prepare and enjoy on this auspicious occasion. Create your own thali with the food suggested below.